Blackwall is a station on Docklands Light Railway (DLR) in east London. The station is close to the northern entry to the Blackwall road tunnel under the Thames. Blackwall station is on the Beckton branch of the DLR between Poplar and East India stations, and is in Travelcard Zone 2. 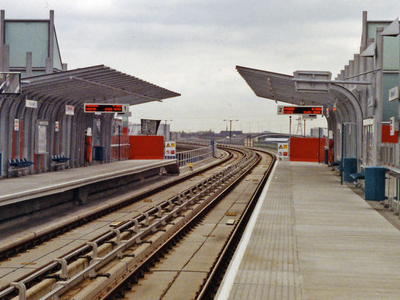 The DLR station opened, with the Beckton Branch, on 28 March 1994. There was a previous station on the same site, called Poplar station, which was served by the London and Blackwall Railway from 6 July 1840 to 3 May 1926. Blackwall station on the London and Blackwall Railway was actually further east. The location of these two stations on the London and Blackwall Railway can be seen in the bottom-right hand corner of the Map of Poplar, 1885, referred to under External links. There is a crossover west of the station which allows trains from Beckton and Poplar to reverse here. Here's the our members favorite photos of "Metro Stations near London Borough of Tower Hamlets". Upload your photo of Blackwall DLR Station!